IMS This cookie is used throughout our site and is essential to our catalogue and ordering systems. IMSSCHOOLS This cookie is used throughout our site and is essential to our catalogue and ordering systems. Please enter the name you wish to have embroidered on this item. You can enter up to characters. You must enter a name before proceeding. Please enter the name you wish to have woven into the nametapes. You can enter up to 30 characters. Would you like to add personalised nametapes to your order? 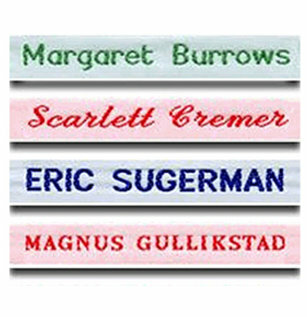 We offer five different styles of woven nametape in four popular colours. These are available in packs of 36, 72 and 144 with prices starting at £7.50.